We’ve been pretty quiet about it, but a while back, Tricia and I got together with our friend Adrianna to launch 88 Gong – the world’s first job board for tech/media/design gigs in Asia. Since its inception, we’ve had over 400 postings featuring jobs from not only China but also India, Singapore, Malaysia and countless other places. Plus, we’ve been fortunate enough to have giants such as TBWA, Uber and Xiaomi using our system. To be clear and upfront: 88 Gong is a not-for-profit project. 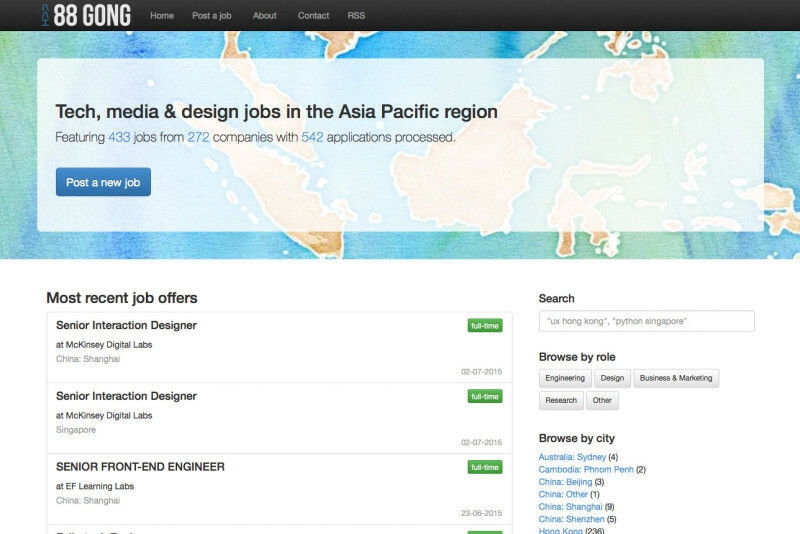 Companies big and small are free to post as long as they are a) not external recruiters and b) posting jobs that are Asia-based and within the tech/media/design sphere. In addition, we do not keep any resumes that pass through our systems (a practice common amongst job board sites). Check it out now – I hear our friends from the McKinsey Digital Labs group just published some job openings in Shanghai and Singapore.